With slots for 7 devices, this charging hub makes sure the tabletops are clear and everyone's devices juiced up. At home or at work, tabletops can get cluttered with mobile devices, and keeping them all charged can be a challenge. But with this high capacity organizer and charger, everybody’s device gets charged, and the desktop stays clear. The Okra 7-Port USB Charging Station has slots for 7 devices. So there’s room for plenty of people’s devices to be kept nice and organized while they charge. Four ports carry an amp of charge, the others a massive 2.4 amps. Power is distributed through SmartFlow Technology, so every device is gets the maximum safe charge. It’ll make any chaotic desktop more orderly, and make sure that no one’s devices go without their daily juice. 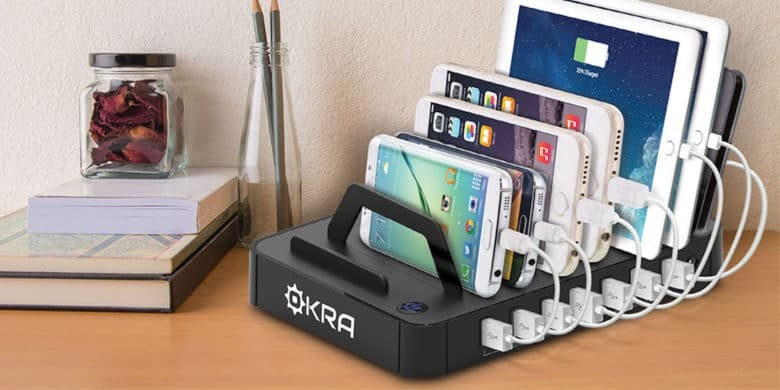 Buy now: Snag an Okra 7-Port USB Charging Station for $39.99, that’s a 60 percent discount.